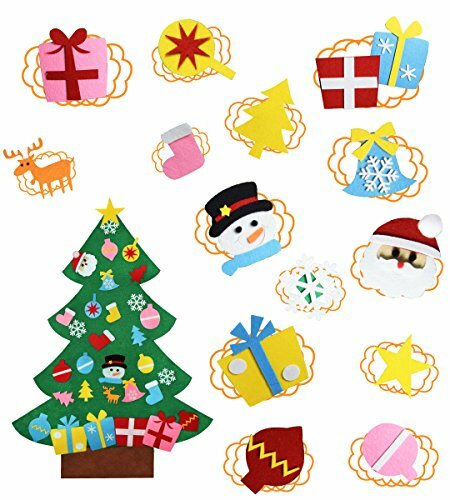 Felt Christmas Tree Wall Hanging 3ft Christmas Tree Set with Ornaments, Christmas Gift for Kids Xmas DIY Decorations by KEFAN at Kids Home Warehouse. Hurry! Limited time offer. Offer valid only while supplies last. 100% felt fabric. Sturdy and easy to roll up for storage---reusable in next year. Package includes double stitched high quality felt fabric tree and Velcro fastening ornaments, easy to put on and take off. Children will have great fun when they DIY with their creation. And also perfect for family interactive plays. Super cute Christmas celebrations decoration on wall, door, garage, classroom...etc. If you have any questions about this product by KEFAN, contact us by completing and submitting the form below. If you are looking for a specif part number, please include it with your message.